To date, CWD has NOT been detected in any Alaskan wildlife. However, Alaska currently maintains a general targeted diseae surveillance program that will test for CWD in clinical, suspect cases in moose, caribou, deer or elk. 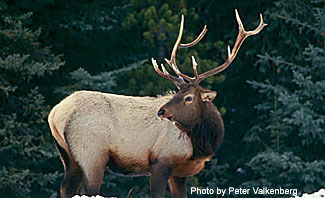 Chronic wasting disease occurs in deer, elk, and moose. Chronic Wasting Disease (CWD) belongs to a group of diseases known as transmissible spongiform encephalopathies (TSE's). Class of diseases caused by PRIONS (=protein infectious particles) which are non-living pieces of protein. Prions cannot be metabolized, and build up in the brain causing an accumulation of ‘holes’ that look like a sponge microscopically. CWD takes at least 6 months to develop in an infected deer or elk, and these signs may depend on the length or extent of infection. CWD is 100% fatal once signs develop. The mode of CWD transmission is known to be passed from animal to animal via the oral route either from contact with: carcasses of infected animals especially “at risk materials”- (brain, spinal cord, lymphoid tissues), saliva, feces, and urine. Prions from these sources bind to the soil in the environment, contaminate water/forage and persist for years. Update: The Alaska Board of Game adopted Prop 104 (PDF 537 kB) during the statewide meeting — January 13–18, 2012, which prohibits the use of deer or elk urine for use in taking game. Where does chronic wasting disease occur? CWD was first detected in captive mule deer in 1967 in northern Colorado. CWD was found only in deer and elk in the wild until 2005 when the first case of CWD in moose was confirmed in Colorado (an area endemic for CWD). Since then, Wyoming has also confirmed CWD in a moose. The newest states to detect CWD for the first time are Minnesota (Jan 2011 — wild white-tailed deer), and Maryland (Feb 2011 — wild white-tailed deer). What are the signs of chronic wasting disease? Animals that are infected with CWD show changes in behavior and may exhibit extreme weight loss, excessive salivation, stumbling and tremors. Do not harvest, handle or consume wild animals that appear to be sick. Wear rubber gloves while field dressing carcasses. Minimize handling of brain and spinal tissues. Wash hands and tools thoroughly afterwards with warm, soapy water then disinfect tools with bleach diluted 1:10 in water. Bone out carcasses. The meat is safe but discard the brain, spinal cord, eyes, spleen and lymph nodes and other inedibles in the appropriate location where the animal was harvested. Skulls and antlers should be cleaned of all brain matter prior to transportation. Do NOT bring unprocessed carcasses or heads from deer, elk or moose into Alaska. There is no scientific evidence supporting transfer of CWD between wildlife and cattle or humans. Whether or not CWD can be transmitted to other animals, how it is transmitted and the risk factors for the disease are all questions that remain to be answered. Confirmation of CWD diagnosis is made by examination and analysis of brain tissue, lymph nodes, and tonsils from dead animals. Tonsil and rectal biopsies are recent advances in live testing deer and elk, however this method is not 100% in detecting CWD.